Sure there's nothing like running into an old acquaintance. A familiar face you haven't seen for a while. If time permits, you can sit together and catch up on each other's news: how are things with you these days? But then there are other familiar faces which may belong to perfectly decent individuals, but conjure up memories of a past event either best forgotten or just too painful to recall. 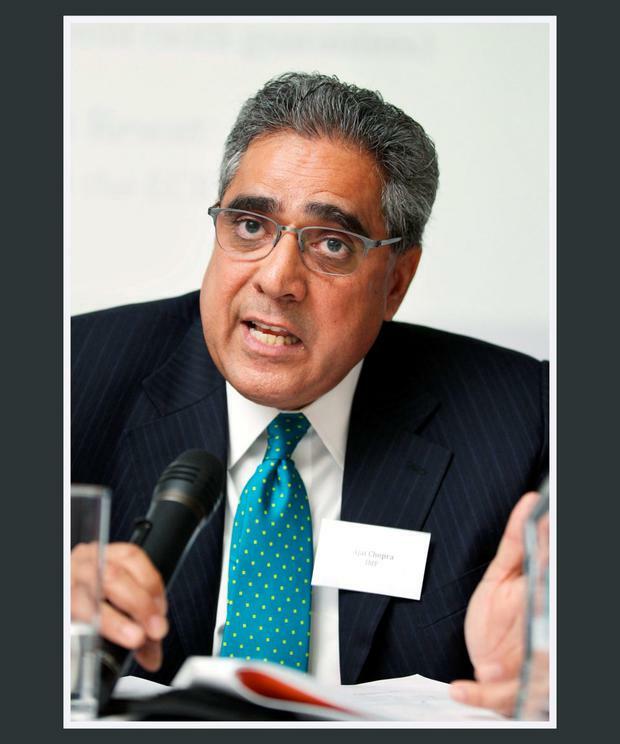 There was snow on the ground and ice in our souls when Ajai Chopra first arrived in Ireland, in the bitter November of 2010. The snapshot of him passing a seated beggar on a Dublin street, while en route to hammer out our €85bn bailout, bleakly captured the depth of the nation's humiliation and despair. The bespectacled, financial firefighter became instantly recognisable as Mr IMF, while his colleagues in the EC and ECB - the two other legs of the Troika - remained largely anonymous figures, even as they quietly stood down our sovereignty. And here was Chopra again, back on his old stomping ground. There was no fanfare this time - he slipped into Leinster House, unaccompanied save for a well-travelled leather briefcase. The former IMF chief was speaking to the inquiry "in a personal capacity", he explained, conceding that while he had become the public face of the EU-IMF programme, it was "certainly not by design, though I guess today's appearance before this committee ironically perpetuates that". Ajai may have spoken in a soft and modulated voice, but he unhesitatingly deployed a big stick and took lumps out of the European Central Bank. While it had provided "enormous support" to Ireland as we ran perilously short of cash, "this support appeared to be only grudgingly provided and its availability and stability did not seem assured". The letters fired off by the ECB's princeling, Jean-Claude Trichet, to then Finance Minister Brian Lenihan were recalled. Ajai's distaste for the ECB's boot-boy tactics was evident. Joe Higgins and Pearse Doherty threw questions on the unequal manner in which the pain had been distributed among the Irish people, but Ajai countered. "Were we fully successful in getting them to implement more measures to ameliorate social hardship? You know, that's for you to judge. These were choices that were made by the sitting Irish government at the time." The former IMF man had begun his appearance with a paean of praise for the Irish team, with whom he had worked to put together the programme and subsequently keep it on the rails. "They were knowledgeable, dedicated, smart, funny and committed to tackling Ireland's difficult situation," he declared. "The nation should be proud of them." After Ajai Chopra's session ended, he walked out through the gates of Leinster House, smiling for the waiting photographers. Then he strolled alone and unnoticed in the afternoon sunshine, down Kildare Street. No one recognised him. He was just a man going about his business. It was nice catching up, Ajai. You weren't the worst of them, and we suspect you got quite fond of us by the end. But please God - and no offence meant - we'll never, ever have to see your like again.